Why Choose a Moen Certified Service Plumber? Moen knows how important it is to have a plumber you can trust. That is why Moen uses strict guidelines to certify independent plumbing contractors. 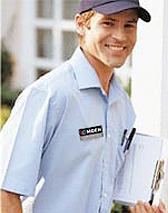 Only MOEN Certified plumbers have access to genuine MOEN products. These products carry higher quality standards and have increased warranties.